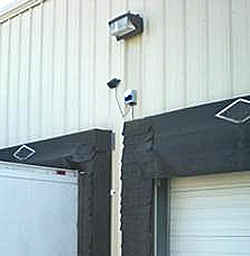 With a 2 door coverage capability, this Loading Dock Alarm provides added safety at the loading dock as trucks approach the dock door. 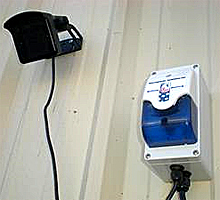 The sensor module is mounted on the exterior wall of the loading dock. Should dock personnel be between the truck and the loading dock, they have both audible and flashing strobe light alarms to warn of impending danger. National Highway Traffic Safety Administration statistics show that 73% of back-up accidents would have been prevented if the pedestrian could have heard a warning signal from a back-up alarm (NHTSA 2-5). OSHA does not require vehicles that travel public roads to have back-up alarms, thereby relieving the trucking industry or private vehicle industry from being required to have back-up alarms. For your employee and pedestrian safety, installing a device that "provides adequate warning to workers in the path of a vehicle, and to workers walking towards the path of the vehicle in time to avoid contact" (OSHA regulation) improves safety and reduces risk of worker compensation claims on your site. 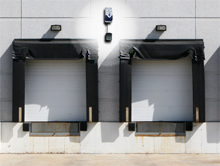 Two-Door Configuration: Setting up your loading dock alarm is a simple process of positioning the sensor at the center point of two loading docks. then positioning the alarm box directly above it and plug the sensor into the alarm box. Four-Door Configuration: In the case of four dock doors, position a sensor between each outer door and the door next to it. 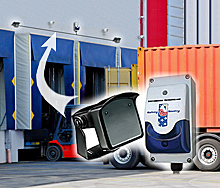 Position the alarm box at the center of loading dock and run cord to the two sensors. Six-Door Configuration: With six doors, position a sensor between each two sets of doors and run cord to alarm box, which is positioned at the center of the loading dock. A third sensor will be positioned directly below the alarm box.